Social Forestry Division under Jaintia Hills District was created in 1985 under the name of Kopli Afforestation of Catchment Areas Division but after attaining its full fledged Division in 1985, it was re-designated as “The Jaintia Hills Social Forestry Division, Jowai”. The jurisdiction of the Division covers the East Jaintia Hills District with a geographical area of 2126 Sq Km and West Jaintia Hills District 1693 Sq Km respectively, with headquarter at Jowai. For smooth and effective functioning of the Division, five numbers of Ranges have been created so far viz. Amlarem Social Forestry Range, Jowai Social Forestry Range, Khliehriat Social Forestry Range, Namdong Social Forestry Range and Shangpung Social Forestry Range. 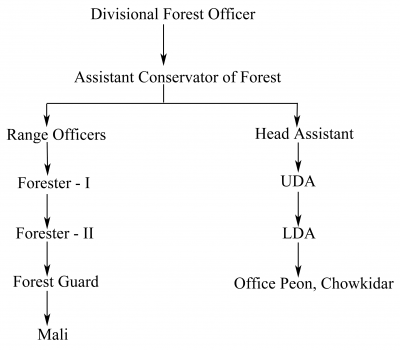 At the Divisional level, the office is headed by the Divisional Forest Officer, assisted by one Assistant Conservator of Forests, Head Assistant and Ministerial Staffs. At the Range level, the offices are headed by the Range Forest Officers assisted by Foresters, Forest Guards and Grade-IV staffs. To achieve the objective of the National Forest Policy 1988 for covering 33% of the land area under forest cover. To promote mass awareness in conservation and protection of forests and environment. Raising plantations of important timber trees and miscellaneous trees for fuel wood, fodder, fruit, MFPs in all categories of excluding Reserved Forests. Increase the natural beauty of the landscapes, creates recreational forests for the benefit of rural and urban population. Provides jobs for unskilled workers. Elicits people participation involving women and young people in conservation of forests. Implementation of Afforestation Schemes of both State and centrally approved schemes with an aim to enhance and to increase the green cover of the District. To re-afforest the large barren and wastelands area of the District through the active participation of the people. To protect the denuded catchment area by way of Afforestation and ensure availability of water supply in a suitable manner. To make people aware of the tangible and intangible value of trees and forests and encourage them to plant, protect and conserve trees. To work in co-ordination with other departments of the Government to achieve the object. To enhance availability of fuel and fodder to the rural people and increase aesthetic beauty of the urban areas. Apprx. 6500 Ha covered till date. Active involvement & participation by the localites. Implemented by the Division since 2004-05. Till date area covered = 2710 Ha with 32 JFMCs. Herbal Garden (Work done by the Department). Nursery, Plantations & Construction works.